This year’s Moving and Relocation Services Annual Awards were very successful for Nuss. At the recent 2013 Cartus Conference, Nuss picked up Gold Service Awards for both moving and relocating, but the real recognition however – the Cartus “Global Citizenship Award” – was received by Nuss employee Jared Goodwin. This award is given to an individual who has made an outstanding contribution to the community by devoting an extraordinary amount of their time, effort and capabilities in the spirit of volunteerism. There were 17 nominations for the prestigious award from all around the world and so for Jared to be recognised as the recipient is just a fantastic achievement! We are immensely proud of him indeed. For over fifteen years Jared has dedicated a huge amount of his personal time to helping young people in need, those involved with drugs, binge drinking, in crime and with various other adolescent problems which can result in suicide. Jared volunteers his time to attend counselling camps organised by the charity ‘Youth Insearch’, to mentor young people and help them confront their problems and put their lives back onto the right path. Jared is the personification of a caring, committed human being. Most of us go through our lives not actually making a significant difference to the lives and welfare of others; Jared is one of the few who has achieved this. The work he has carried out…..in his own time, selflessly volunteered…. has turned around the lives of a great many young, vulnerable adolescents. 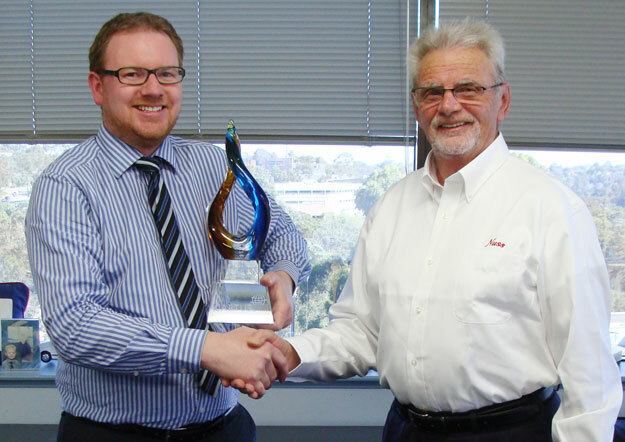 Picture: Jared Goodwin (left) congratulated by Robert Nuss when the trophy was brought to Sydney from Cartus. Jared has over the last 15 years devoted countless hours after work during week time and around 89 weekends all without pay. In addition to the magnificent trophy which Jared gets to keep, Cartus very kindly donated $ 3500.00 to Jared’s charity of choice which is as might be guessed ‘Youth Insearch’; thank you Cartus for your generous donation. So, our congratulations go out to Jared and we wish him every success in his continued efforts. The two Gold award trophies awarded to Nuss were in recognition of continued high quality service provision in both the Moving services and Relocation services categories. 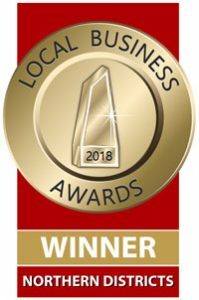 These awards are not easily achieved so we are very proud that the hard work, dedication and commitment of all our team at Nuss has been recognised yet again. It was certainly a night to remember for Nuss Removals and Relocations and we will work just as hard in the coming year to achieve and to exceed our clients’ expectations. Copyright © 2018 Nuss Removals PTY LTD.